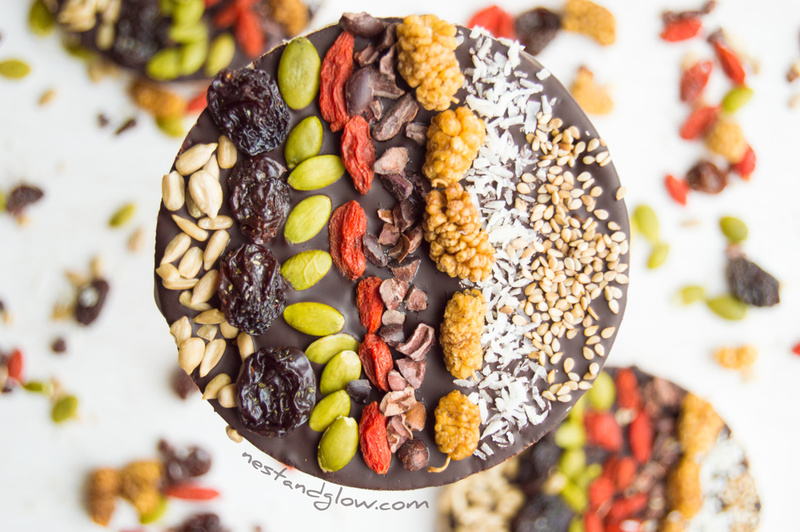 These Dark Chocolate covered Rice Cakes with fruit and seeds taste even better than they look! The perfect mixture of crunchy seeds, chewy fruit, crispy brown rice cakes and rich dark chocolate make for a delicious healthy snack. 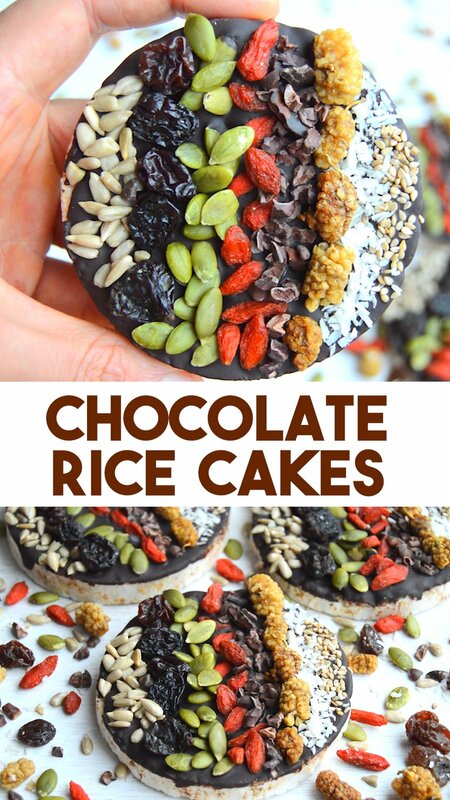 What can be a better way to eat a rainbow of different foods to ensure you get a range of vitamins and minerals from natural produce than these chocolate rice cakes? Suitable for vegan, dairy-free, gluten-free, wheat-free and general healthy diets. I love dark chocolate coated rice cakes but sadly the ones in the shops usually use a high sugar chocolate. So I’ve re-created with 85% cacao very dark chocolate and coated with seeds and fruit. Even if you are not a huge fan of dark bitter chocolate you may find this sweet enough with the raisins, mulberries and goji berries. [youtube https://youtu.be/gARP-kK40I0] The reason why you melt 3/4 of the chocolate and then add the final 1/4 is to help get a good temper on the chocolate so it has a glossy shine and a good snap. It’s a quick and easy way to get about the right temperature chocolate for these chocolate rice cakes without using thermometers and bowls of ice. Just this mixture of seeds and dried fruit would make an excellent trail mix on its own! Or a great topping for something like my Chocolate Quinoa Avocado Fudge Cake. 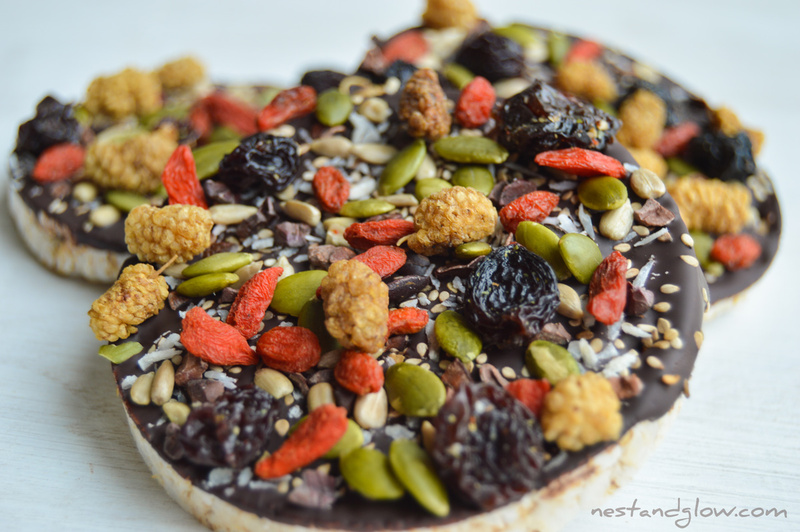 You can use any combination of dried fruit, seeds and nuts when you make these chocolate rice cakes – just aim for a range of different colours. Dried fruit is better than fresh as it will keep and won’t make the rice cakes soggy. I made these chocolate rice cakes nut-free (coconut and cacao are actually seeds) so it’s cheaper and suitable for those on a nut-free diet. I also probably eat too many nuts and not enough seeds so this helps to balance it out. 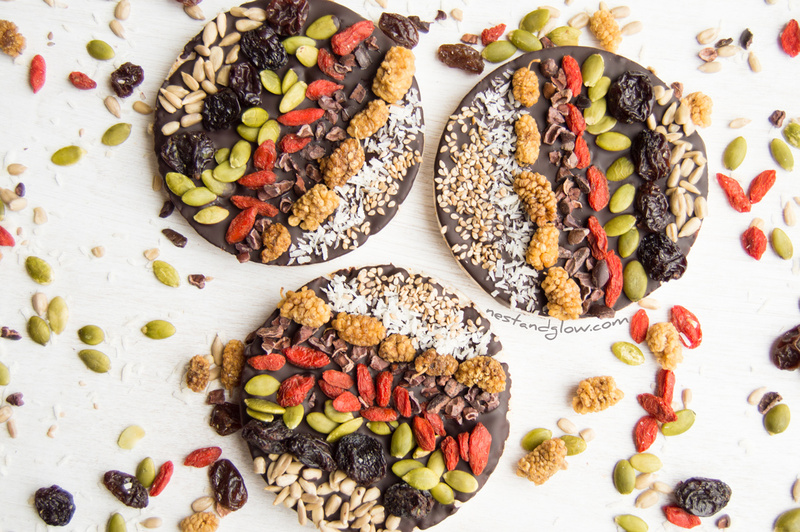 These chocolate rice cakes don’t just look pretty but actually turn a humble rice cake into a nutrient dense snack loaded with vitamins, minerals and protein. Always store these chocolate cakes in a very airtight container as rice cakes will go soft otherwise. I couldn’t decide if I should make the fruit and seed topping uniform or random so chose both! The uniform pattern actually holds the seeds and fruit firmly so it’s recommended if you want to travel with these in your backpack. When you dip the rice cake in chocolate remember to dip the smoother pressed side. Not a huge problem if you don’t but it will take more chocolate to get a covering of the uneven surface. I used brown rice cakes that contained sesame and sea salt. The brown whole grain rice cakes are preferable for health reasons as they contain more nutrients and fibre with a slow GI release. Brown rice cakes don’t really taste that different to the high GI white rice cakes and the colour is only slightly brown as they are puffed up. 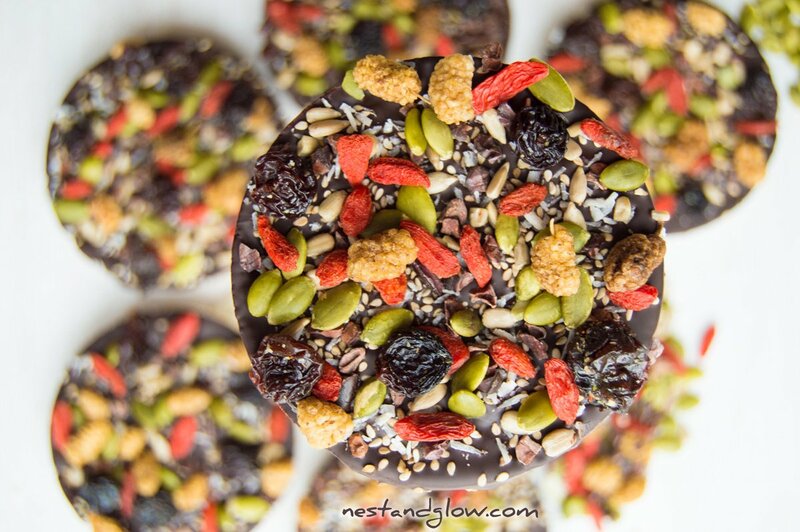 To make these chocolate rice cakes totally sugar free then choose a chocolate bar that is sweetened with a healthy natural sweetener such as xylitol or stevia. Fruit does have sugar but it comes with the fibre meaning its absorbed slower and far harder to overeat. Chop the chocolate up and melt 3/4 in a bowl over hot water. Pick a bowl with a flat area that’s at least the size of a rice cake. Add the last 1/4 of the chocolate and stir off the heat until melted for easy tempering. Dip the rice cake in the chocolate to coat then sprinkle with the toppings. Place in the fridge for 10 mins to set and enjoy. Store the chocolate rice cakes airtight otherwise they may go soggy.